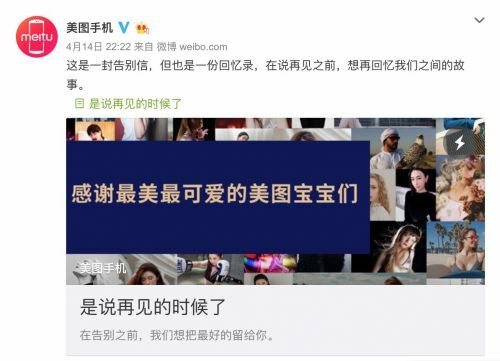 [TechWeb] April 15-yesterday night, Meitu's official Weibo issued a farewell letter announcing that it would close its mobile phone business in the middle of the year and grant its brand exclusively to Xiaomi. At the same time, Mito phone said that the after-sales service of Mito mobile phone will still be responsible for Mito. Regarding the reason for the closure, Meitu Mobile said in the farewell letter that the Mito phone is small and can't reduce the cost to cater to the intensifying price war, so it decided to close the mobile phone business. On May 16, 2013, Mito Mobile 1 was born, and it is also the Meitu mobile phone officially meets with you. Until recently officially bid farewell to everyone, Mito mobile phone has existed for less than 6 years. I am sorry to finally meet you in this form. Maybe you are a stranger in the first encounter. The first time you meet is goodbye. Maybe you are an old friend who knows us. You have a lot of curiosity and doubts about us, but there are more Reluctantly, the business of Mito's mobile phone will also be handed over to Xiaomi. This is a farewell letter, but it is also a memoir. Before saying goodbye, I want to recall the story between us. May 16th, 2013 is the first time we met. The first mobile phone in China, which is dedicated to self-portrait, was born. It is also the world's first mobile phone with a front-facing 8 megapixel camera. On the day of the launch, all of us stared at the screen to see the increase in trading volume. The atmosphere seemed to be as tight as the results of the college entrance examination. Maybe it was not enough at the time, but it represented our wish to make a good product, but What makes us excited is that behind the beating numbers, it represents the beautiful dreams realized by Mito mobile phones. From that moment on, we ran hard on the runway of the mobile phone. Although we are not the fastest, we never thought about stopping. Fortunately, there are many people along the way to help us along the way. Also gained a lot of companionship and touch. I still remember that at a Meitu fan meeting in 2015, we met an independent travel photographer called Chenxi. She was very happy to share with us the photos taken with the Mito phone during her journey. We casually said something. "Let's shoot well, I hope I can see a little more in the future." After a month, we were pleasantly surprised to receive a photo of her from Nepal, which read her sentiment and what we said to us. From now on, we can receive photos of her Mito mobile phones sent from all over the world every month. A casual word has become the link between us for more than three years. We are very happy to have a mobile phone. Became her eyes to see the world, and received her photos as if we were in every corner of the world. We remember seeing couples traveling with Meitu mobile phones to selfie photos, on the streets of Chengdu, in the forests of Taiwan, on the coast of Hawaii, in front of the Icelandic mountains, on the streets of Chengdu, on the forests of Taiwan, on the coast of Hawaii, in front of the mountains of Iceland. Looking at the photos of their sweet smile, we are moved for them, but at the same time, more is to feel a kind of trust warmth. Still remember, we also met a college girl who used her first salary to buy a Meitu mobile phone for her mother. She said that she was alone away from home and often saw some good-looking photos sent out in her mother's moments. She would think her mother was still in her childhood memory, and she wanted time to slow down so that she didn't feel bad about getting old. It turned out that there was no age limit in the matter of beauty. Have been embarrassed, more really touched and warm. Many loyal fans, every time we see our Weibo under the keyboard of the brainless black speech, they are mad at the bottom and people argue, more fierce than quarrel with the boyfriend. In our hearts, you are our family. I still remember that we had been blushing for a small function, and we had been crying at the moment when a few of the wanted conferences ended. We experienced the reflection and annoyance of hearing user criticism. I am looking forward to the surprise when I found a small egg in my mobile phone. To make a mobile phone that makes more people beautiful, so it means a niche, it also means a small amount of money, can not reduce the cost to cater to the intensified price war, so we will close the mobile phone business in the middle of the year, will be its Mito mobile phone The brand is exclusively licensed to the Xiaomi Group. But you don't have to worry that we haven't heard from you since then. We will still be responsible for the after-sales service of the Meitu mobile phone. We will solve any problems with the Meitu mobile phone in your hand as before, and we will solve it for you at the first time. Perhaps, parting is the normal life, as a child can also cry and act like a spoiled child, grow up can only squeeze out a smile to face, we cried together for our small dream, laughed and worked hard, your support is the greatest treasure we reap, Unfortunately, we can only walk here together on this journey, as long as the memory we leave you is good, we will be satisfied. In the past, we liked to call ourselves a beautiful teacher. In the end, we still say goodbye to everyone in this status. The US teacher must start class first! After that, there will be no ringing of the class bell. The Mito V7 will be the last Mito mobile phone with pure blood. It has the front and rear four photos, the Snapdragon 845 chip, etc., all of which are our pride. The Lamborghini limited edition has a super high collection value. Before we say goodbye, we want to leave the best for you. 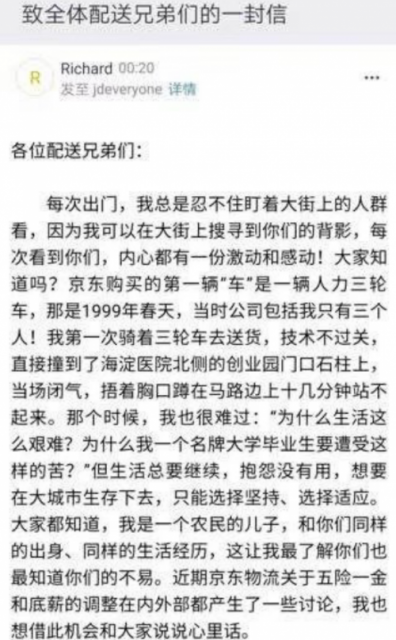 I want to quote Zhang Zhenyue’s lyrics directly. "I am afraid I have no chance. I will say goodbye to you, because I will never see you again." - Love you, like you love a beautiful mobile phone. I wish you all the best. Bye. Liu Qiangdong sent an internal letter in the early morning: JD.com Logistics lost more than 2.3 billion last year to cancel the basic salary, not to lower wages. Can a short story vending machine that prints a novel on a note save your "reading disorder"? Is there a future in the office? Mercedes-Benz "oil spill" car incident tracking, 15,000 financial service charge is exactly what? I trust this company, so I trust "auto driving"
After analyzing the 50 most popular apps, I came up with ways to improve user stickiness.